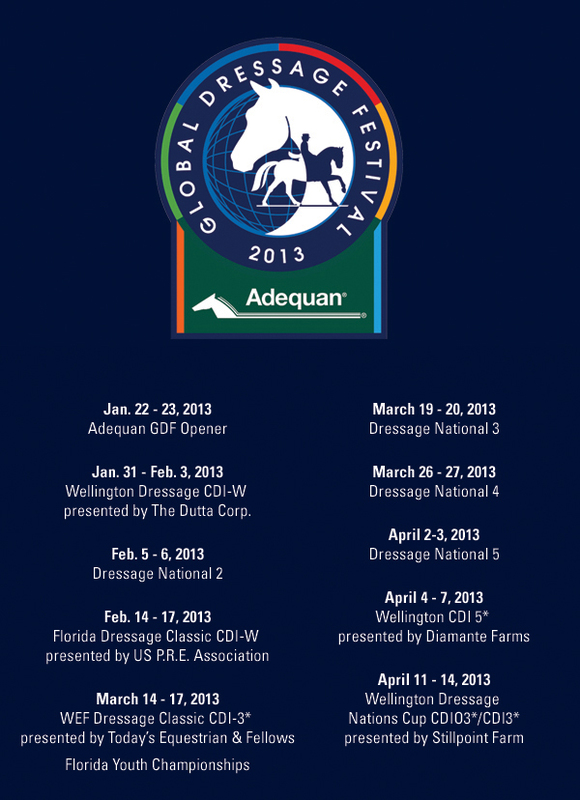 Wellington, FL – April 13, 2013 – The highlight event of the Adequan Global Dressage Festival (AGDF) crowned its victors Friday afternoon at The Stadium of the Palm Beach International Equestrian Center (PBIEC). 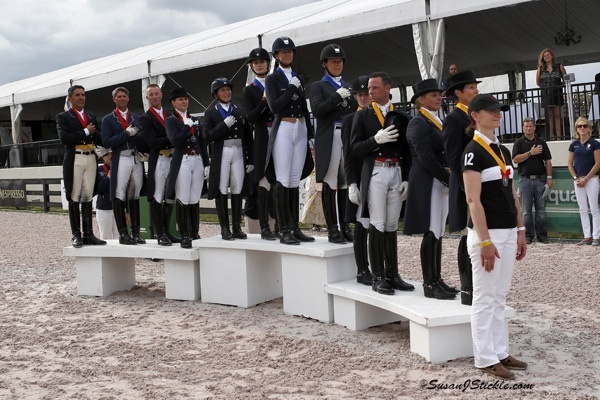 Ten teams competed in the Wellington Nations Cup CDIO 3*, presented by Stillpoint Farm, including two from both the United States and Canada. Team USA 1 finished first with a total of 219.313 points. Team USA 2 was second with 208.675 points and Team Canada 1 rounded out the top three teams with 205.346 points. Following the close of yesterday’s Nations Cup competition, a protest was filed by the Chef d’Equipe for Team Europe with the Appeals Committee for Mikala Munter Gundersen (DEN) of Team Europe on the judging of her ride. There was a meeting on Saturday morning at 9:30 am with the FEI Representative, The President of the Ground Jury, the FEI steward, the three members of the Appeals Committee – Lorraine MacDonald (CAN), Marian Cunningham (PER), and Sandy Hotz (USA) – the Team Europe Chef d’Equipe, and Mikala Munter Gundersen. Judges for both classes yesterday were: Anne Gribbons at E, Joan Macartney at H, Linda Zang at C, Evi Eisenhardt at M, and Mirabel Alonso at B. 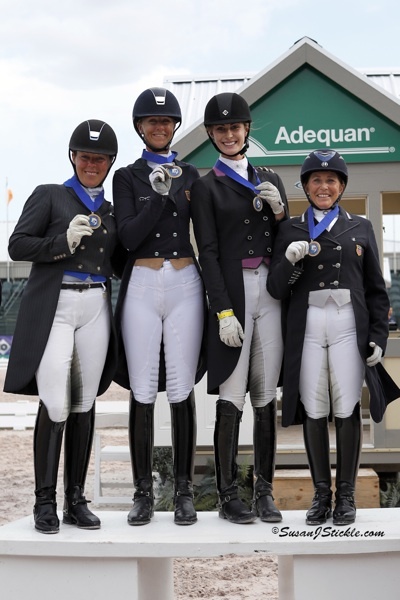 Team USA 1 included Prix St. Georges competitors Kimberly Herslow and Rosmarin and Caroline Roffman and Her Highness O, in addition to Grand Prix competitors Heather Blitz and Paragon and Shelly Francis and Doktor. The team put in remarkably high scores throughout Friday’s competition, including the high scores for both classes of the Nations Cup competition. Herslow and Rosmarin earned the top score of the FEI Prix St. Georges CDIO 3* class with an impressive 72.079%. 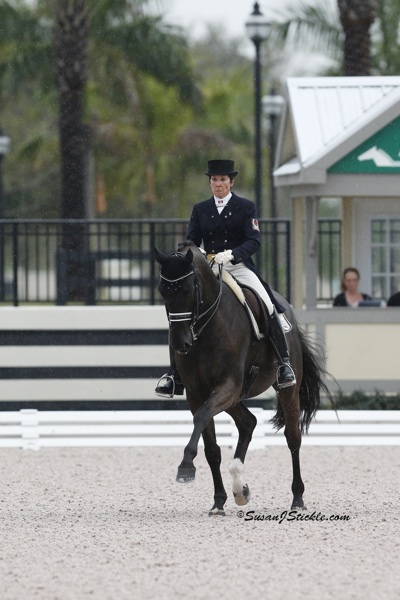 Blitz and Paragon finished first in the FEI Grand Prix CDI-O 3* with a 71.021%. 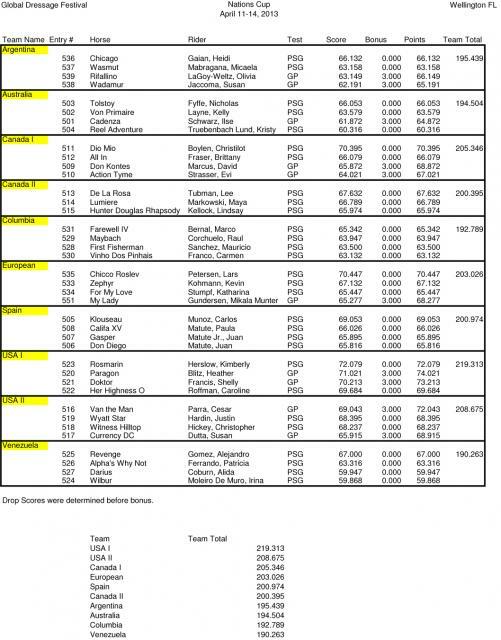 Blitz had another 3% added to her grand prix score with the new format of this Nations Cup competition to contribute a total score of 74.021% for the team competition. Blitz’s mount, Paragon, also developed substantially this season in Wellington. 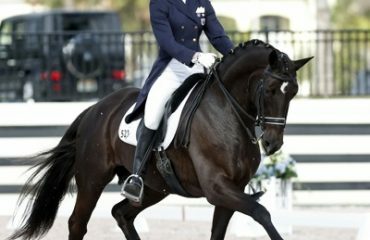 “Now that’s he’s just turned ten years old, I think that he’s just coming into his own as a Grand Prix horse. I was really happy with how he was in the ring. He’s getting a lot more connected and more confident,” Blitz commented. Blitz is eager to see where Paragon’s newfound confidence will take them, as she’s certain this is only the beginning of the Danish Warmblood gelding’s success. “I think in general it was one of my favorite tests I’ve had on him so far in the Grand Prix, and it’s still not anywhere where he’s going to be. There’s a lot left and I can’t wait to keep training him,” Blitz beamed. 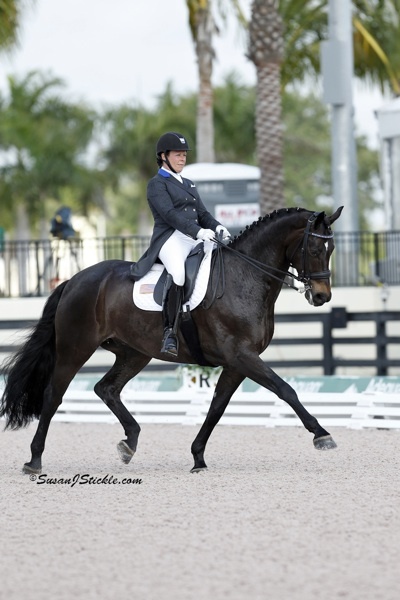 Francis and her mount Doktor, a nine-year-old Oldenberg gelding owned by Patricia Stempel, are on an equally fortuitous path to success in their first year of Grand Prix competition together. Doktor had top finishes during the AGDF Wellington 5* and contributed a total score of 73.213% (with the 3% addition for a grand prix score) to the team. “I really was very pleased with him today. He was really there and wanted to do everything really well. 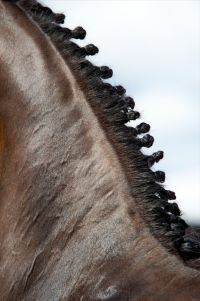 The pirouettes were better, his piaffe-passage was steadier, I was very happy with him,” Francis described. 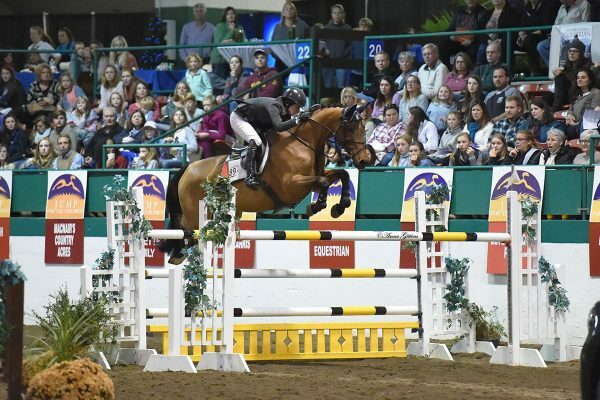 For the first time in Nations Cup history, teams consisted of both Prix St. Georges and Grand Prix level horse and rider combinations as a precursor to raising the level of competition at the Pan American Games. While Friday’s competition served as a test for the newly formatted mixed teams, riders across the board agreed it was a success while working through the growing pains of new rules. 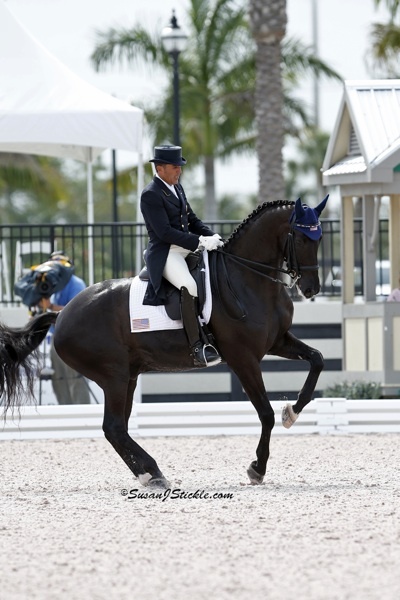 Roffman, who competed at the Prix St. Georges level for Team USA 1 and had a score of 69.684%, was eager to take part in team competition again and was pleased with the outcome of the new format. “I think it’s a great experience to be on a team and get that experience in such a fun atmosphere and at a great showgrounds. It’s wonderful to do and I think it’ll make a great format, however they end up working it out. It certainly worked well, I think,” she commented. Roffman’s fellow Americans on Team USA 2 echoed her sentiments, crediting the AGDF with fostering a great competition for the development of the sport. Christopher Hickey credited the unique opportunity for international competition during the winter in Wellington. “There’s probably not very many other places in the world that a show could get ten teams to compete and I think that’s pretty special. 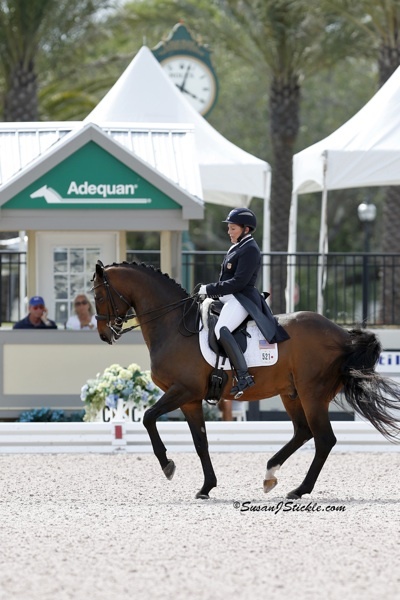 I think dressage in Florida in the winter is a place that it is possible to get a number of teams like that and I think that’s a wonderful thing,” Hickey described. Hickey also applauded the show management’s efforts to include competitor feedback in the process of bringing in a new format of competition. “The office and the management team [for the show] understand and know this is the first time this format has been done and everybody from the beginning wanted the competitors’ opinions on things. I think that shows competitors that [they] want it to be successful. I think that’s pretty special to this place,” Hickey acknowledged. 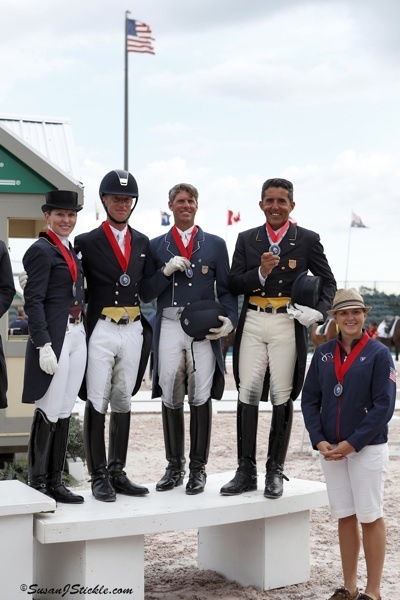 Team USA 2 consisted of Cesar Parra and Van the Man (total 72.043% grand prix score), Susan Dutta and Currency DC (total 65.915% grand prix score), Justin Hardin and Wyatt Star (68.395% Prix St. Georges score), and Christopher Hickey and Witness Hilltop (68.237% Prix St. Georges score). Team Canada 1 was thrilled with their team’s top three finish and was eager to be a part of developing the sport in the Americas. Their team consisted of Christilot Boylen and Dio Mio (70.395% Prix St. Georges score), Brittany Fraser and All In (66.079% Prix St. Georges score), David Marcus and Don Kontes (total 68.872% Grand Prix score), and Evi Strasser and Action Tyme (64.021% Grand Prix score). Veteran competitor Evi Strasser summed up the team’s sentiments best. 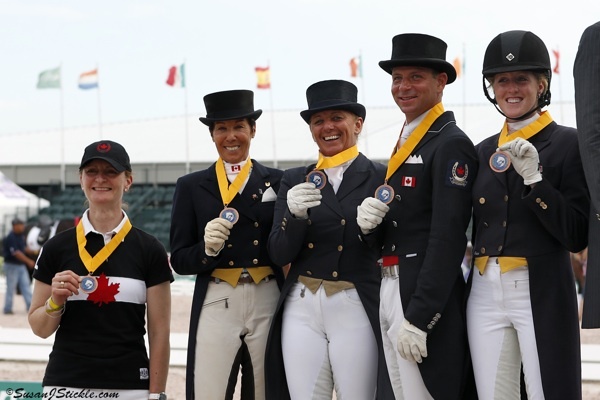 “It was a great time having the strong team we had for Canada and for the young riders we had coming up too. Everything was just perfect,” Strasser described. 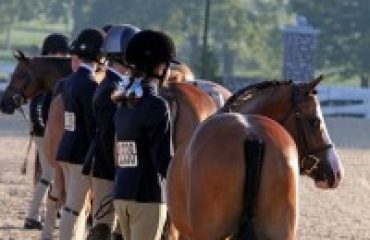 Wellington Equestrian Realty sponsored the CDI 3* classes hosted in the Van Kampen Arena of The Stadium throughout Friday afternoon. Caroline Roffman (USA) and Sagacious HF finished first in the FEI Intermediare-II 16-25 with a final score of 71.930%. 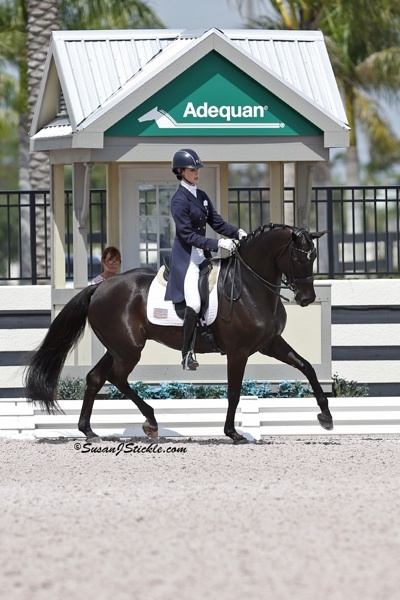 Bebe Davis (USA) and Rotano clinched victory in the FEI Junior Team class after scoring a 65.811%. 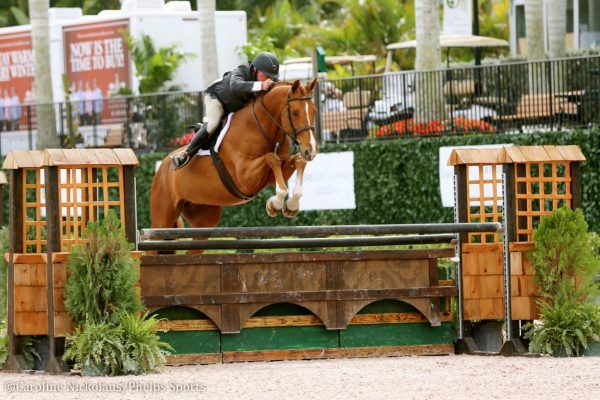 Madison Lawson (CAN) and Mcguire won the FEI Young Rider Team class with a score of 61.535%. The FEI Prix St. Georges class awarded top honors to Christilot Boylen (CAN) and Hudson 18, who scored a 68.421% to finish first. The top 50% of Friday’s competitors will move forward to compete in their respective Freestyle classes. 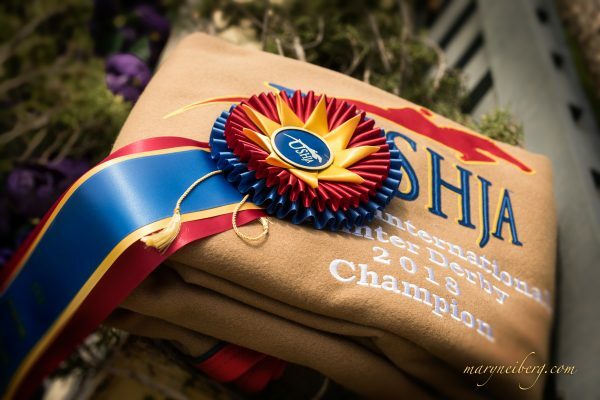 The FEI Intermediaire-1 Freestyle CDIO 3* will start at 3:35 pm this afternoon and continue until 5:30 pm. After a dinner break, the last group of riders will compete at 7:30 pm. 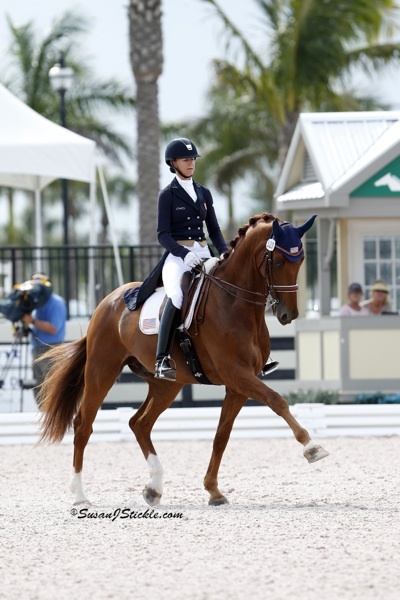 The FEI Grand Prix Freestyle CDIO 3* will start at 8:30 pm. 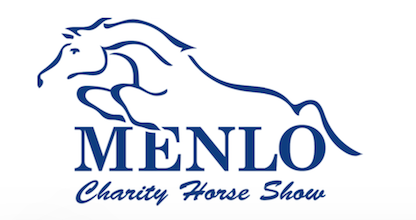 Out of the ten original riders, the five moving on to Saturday evening’s competition will be Heather Blitz and Paragon (USA), Shelly Francis (USA) and Doktor, Cesar Parra (USA) and Van the Man, Susan Dutta (USA) and Currency DC, and David Marcus (CAN) and Don Kontes.